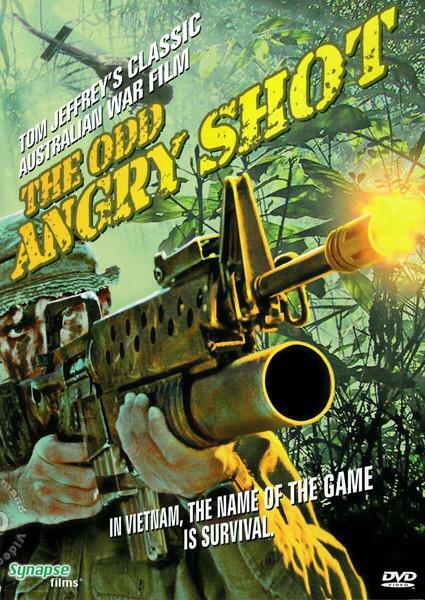 Tom Jeffrey's classic Australian film, THE ODD ANGRY SHOT, is set in the late 1960s during the vicious war Australians shared with the United States: the struggle for Vietnam. Harry (Graham Kennedy), a hard-edged Special Air Service Corporal, meets a new company of soldiers during his second tour in Vietnam. There's the naïve Bill (John Jarratt), the easy-going Bung (John Hargreaves), the blunt Rogers (Bryan Brown), the pragmatic Dawson (Graeme Blundell), and the youthful and innocent Scott (Ian Gilmour). Because of their training as professional soldiers from Australia's toughest Army unit, these men believe they can deal with any situation. They pass the time playing practical jokes, getting into brawls and humoring themselves to keep their minds off the war. But, when the first “odd angry shot” rings out, and an enemy mortar barrage hits their camp causing many casualties, the men realize their protective shield of humor is no defense at all against the harsh realities of armed combat!